Morning sunlight streaming bright through the windows. Dust particles glinting slowly in the rays onto clean, white sheets. The decadence of Sunday morning. It is almost iconic in this country where we work so hard and too often fail to recognize the things that truly give us peace. Of course, this leads us to breakfast. Pancakes and bacon. They seem so very simple, but perfecting pancakes and bacon takes perfect execution. Perfect. Let’s begin with the bacon. Buy excellent bacon. Oscar Mayer has no seat at this table. Also, thick cut bacon yields better results than regularly sliced bacon. I like Wright natural applewood smoked bacon. I also like Kirkland Signature Thick Cut Bacon, but it is a tiny bit saltier than the Wright. You want your bacon to be slightly crisp, but still have a chewy component to it. 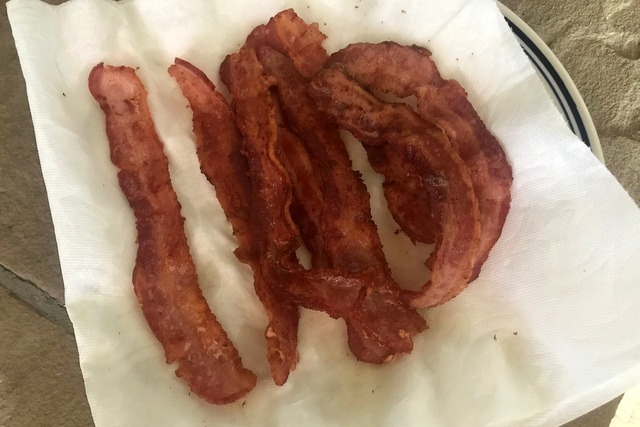 Over crisped bacon quickly takes on a burnt flavor and it gets too crumbly. 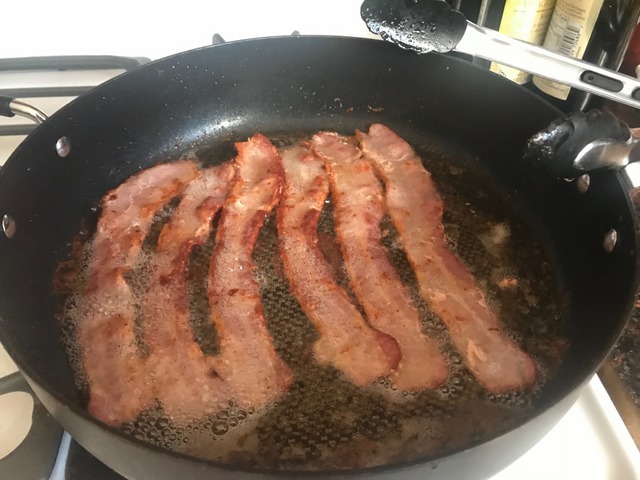 I normally use a cast iron pan to cook bacon, but any pan will work as long as you are vigilant. Cook bacon over medium-low heat and here is the key: turn it several times. Bacon cooks best if you take your time with it. Small batches, lower heat, and turn it at least four times during cooking so that neither side gets over-exposed to the heat. Don’t forget to drain it on paper towels to de-grease it. Now let’s talk about pancakes. There is a science to pancakes that we must first briefly discuss. I generally believe that cooking, and perhaps baking in particular, is an art form, and it is, but it is an art form that is built on chemical reactions. 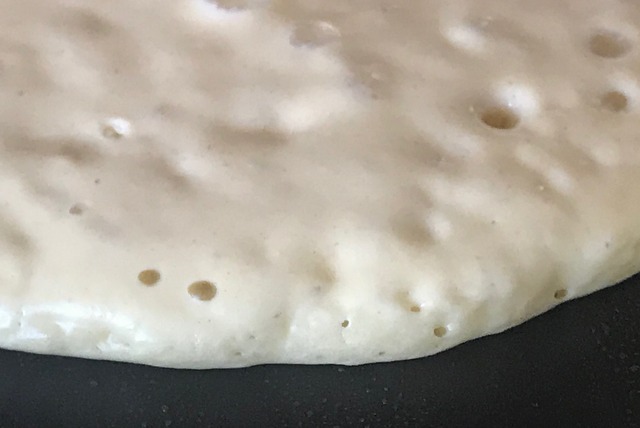 The best pancakes have a very delicate crispness to the edges, but they are exceedingly tender inside, fluffy for sure, with a hint of moisture, and they must be flavorful. The fluffiness of baked goods results from tiny bubbles (gas pockets) within the batter or dough that leave hole patterns in the finished product. In bread, we achieve this by using a fungus called yeast that consumes sugars present in the dough and releases carbon dioxide gas, causing the bread to rise. During the banking process, those air pockets further expand, and as the gluten and starches heat, they transform into a dryer and spongier texture that is bread. Baking soda is an alkaline powder that we combine with a liquid and an acid to also form carbon dioxide. Baking powder is baking soda combined with a powdered acid and a starch. The only thing required to activate baking powder is a liquid, and it, too, produces carbon dioxide. Baking soda has another chemical characteristic. It influences browning. Baking soda will help us to produce that wonderfully inviting, browning we love to see on our pancakes. This is called the Maillard reaction. Another essential ingredient is buttermilk. I need to say a few words about this because buttermilk is important. Buttermilk is the whey left after cream has been churned into butter. Historically, whey was fermented and thickened into a sour liquid whose shelf life was longer than fresh milk. Today, buttermilk is made by adding a bacteria that consumes lactose (Streptococcus lactis) to regular milk. It is commonly believed that “souring” milk with an acid, such as vinegar or lemon juice, will make buttermilk. This is absolutely wrong and false and will not yield good results in nearly every case. This is certainly the case with pancakes. You are much better off substituting a soured milk product instead of trying shortcuts that will produce bad results. Cooking is, after all, a science, too. You can use a 1:1 ratio of milk and sour cream or crème fraîche or a 2:1 ratio of yogurt to milk. When you make the pancakes, you can use a griddle or a cast iron pan. Either will work fine if the surface is hot enough when you begin, you season it correctly, and the surface temperature remains constant. 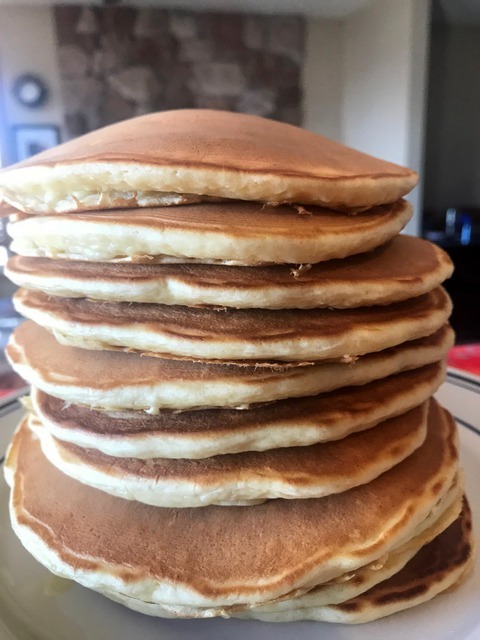 Pancakes cook best at a surface temperature of 375ºF. Test your surface by spattering water droplets on it before adding the batter. The griddle is ready when the droplets sizzle and dance on impact. Also, do not overgrease the surface. 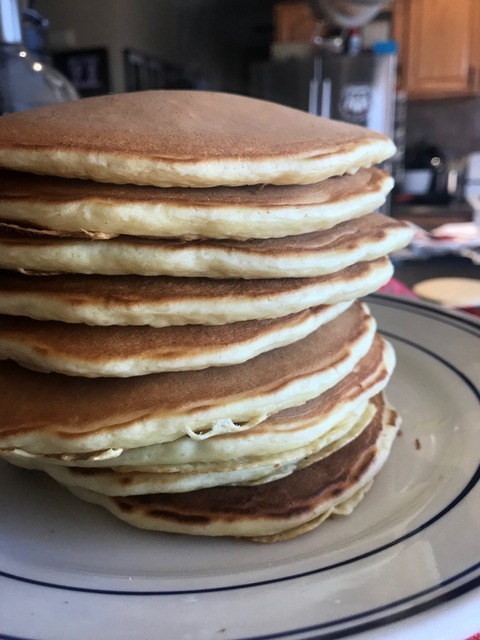 Clarified butter is the best choice for pancakes, but wipe it with a paper towel before you pour the pancake batter so that there is no pooling or droplets of butter or grease that will spoil the complexion of your pancakes. Use high quality, salted butter on your finished pancakes, such as Kerry Gold Irish Butter. And use a real maple syrup, not a grocery store, corn syrup concoction. Do not flip the pancakes more than once and do not flip them prematurely. Pancakes are ready to be turned when they are very bubbly and the edges begin to dry. Beat together wet ingredients until well blended. In a separate bowl, whisk the dry ingredients until well blended. Using a wooden spoon, mix the dry ingredients into the wet until just blended. Do not over mix. Immediately begin cooking your pancakes. 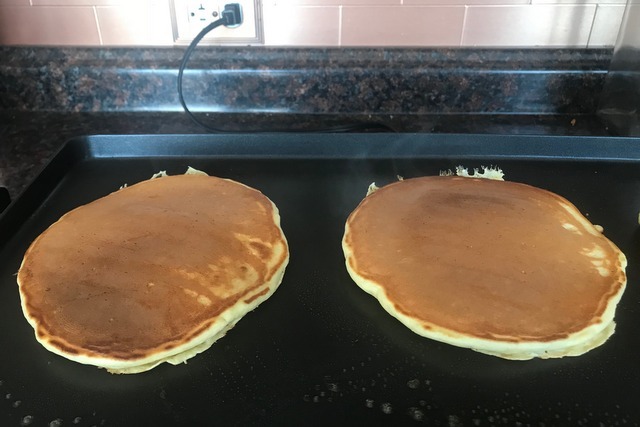 The longer the batter sits, the more the gases will diffuse and the denser your pancakes will become. 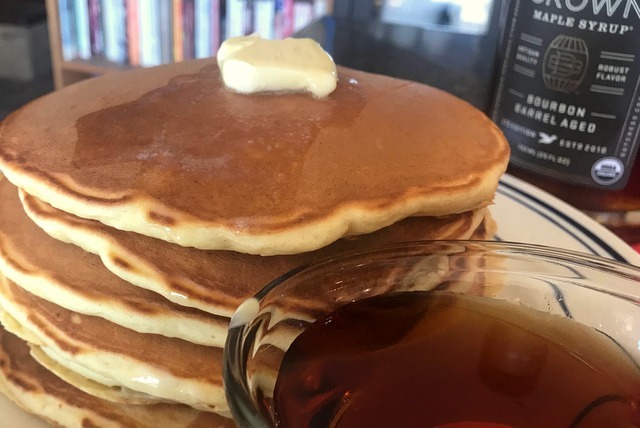 Serve these pancakes well doused in a high quality butter, such as Kerry Gold Irish Butter and with an excellent, real maple syrup.